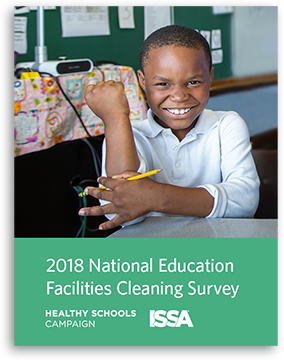 Click to download the 2018 National Education Facilities Cleaning Survey. With green cleaning becoming more prevalent and integral to the health and wellness of children, Diversey, the leader in providing smart, sustainable solutions for cleaning and hygiene, is proud to sponsor Healthy Schools Campaign’s (HSC) Green Clean Schools program. Good indoor air quality (IAQ) in schools is crucial for student health and wellness, and can be ensured by using the right products, tools, and procedures. For instance, Diversey’s GREENGUARD Certified system has been rigorously tested and proven to result in good IAQ. In addition to solutions that promote safety and sustainability, Diversey also helps facility managers enhance the image of educational environments and reduce labor costs, which is essential given the tight budget constraints that many districts face. Together, Diversey and HSC will focus on establishing a vibrant network of school facility managers who are dedicated to ensuring that schools use products and practices that protect both student health and the environment. Through programs and events like the Green Clean Schools Track at the ISSA Show North America and webinars, HSC is raising awareness about best practices and building leadership skills that will help facility managers elevate their green cleaning programs to new heights.